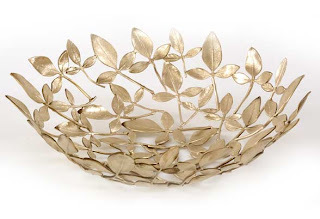 Hi, really like your Leaf Bowl. Would you be able to supply it as bare brass rather than coated in gold paint as in the Conran Shop? Glad you liked it, Pippa. The ones at the Conran store aren't painted gold. When you use lead free brass thats what the colour looks like. The thought of using paint is mortifying. plating maybe but no painting. The brass is sometimes patinated.